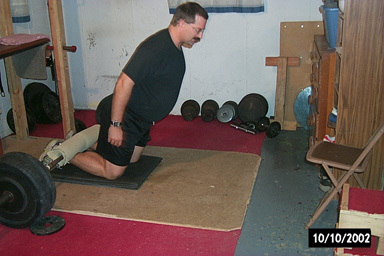 This article describes how to do the Glute-Ham raise exercise when you do not have access to a Glute-Ham-Raise machine. The Glute-Ham raise is highly recommended for sprinters and lifters. 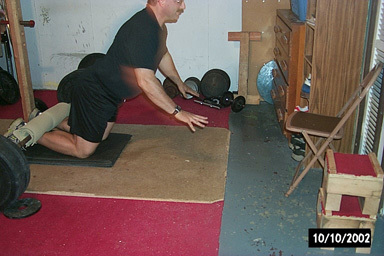 I wanted to work on this exercise, but had neither the money nor the space for a specialized GHR bench. So I used what the equipment I had available and came up with a setup that has worked well for me. Here is the setup in my basement gym. I have a foam pad wrapped around the bar. I took the rubber mats I usually keep the weights on and moved them so that I will kneel on them. 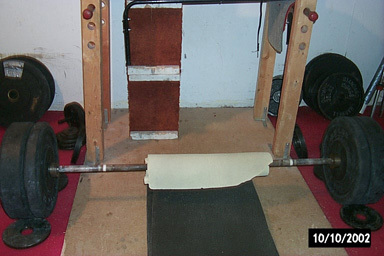 I put enough weight on the bar, and put some small weight under it to keep the bar from moving. Here is the starting position. I have my feet hooked under the bar, with my knees on the rubber mats. 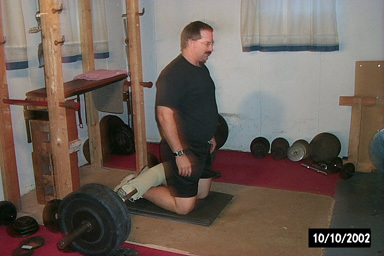 I have my arms ready to help push at the beginning, as I am not strong enough yet (as very few athletes are) to do the raise unassisted. To lift up, contract your hamstrings and glutes as hard as possible. This is the finishing position. From here I am ready to go back down and do it again. Here I am doing the negative part of the movement. The calves, hamstrings, and glutes are all contracted to try to maintain control as long as possible. When you can no longer control the negative, get your hands out to keep you from falling flat on your face. My goal on these is to eventually be able to do unassisted reps. I am currently well short of this. However, I am able to resist the negative almost all the way down. My current routine has me doing these at the end of my afternoon workout twice a week. I do anywhere from 5-7 sets of 4 to 6 reps. I focus intensely on contracting the hamstrings as forcefully as possible. It may take you awhile to develop the mental connection with your hamstrings, but keep working on it. I like to do two different types of sets of these. I do them for speed and try to contract as quickly as possible, and use a moderate speed on the negative. The other way I do them is focusing on the negative, making it as slow as possible and trying to resist until my chest almost touches the floor. WARNING! If you have not done these before, your hamstrings will become very sore, and you may experience cramps. Take your time with working up on the reps and sets.